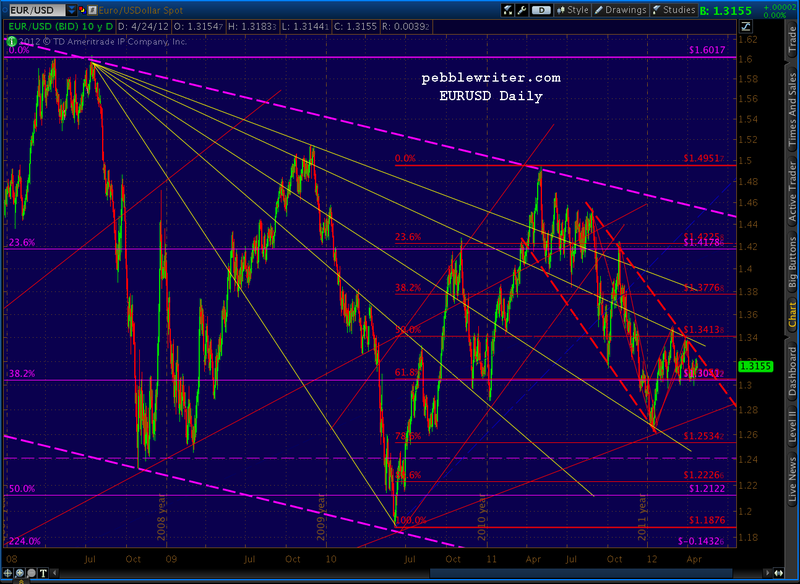 From both a fundamental and technical standpoint, the long-term, medium-term and short-term pictures are all negative on the EURUSD. Yet, it keeps hanging in there, the beneficiary of a great deal of ECB and, yes, Fed intervention. 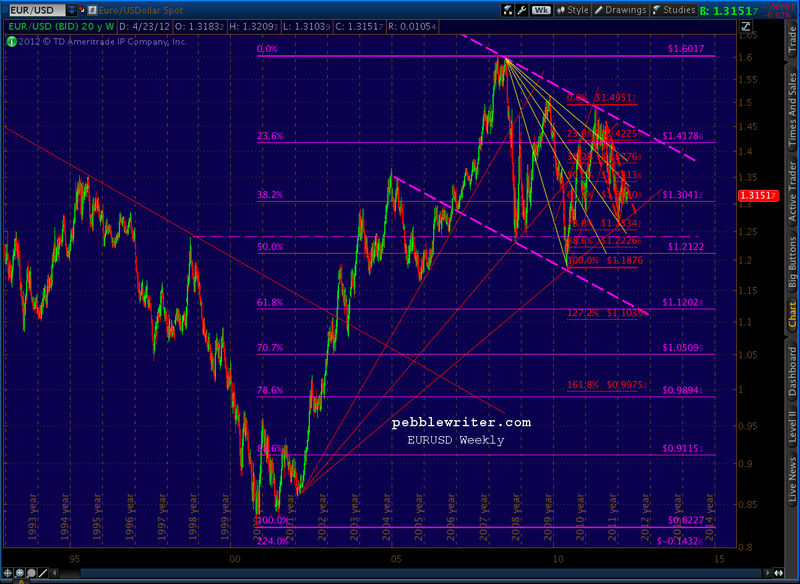 Here's the long term picture as of this morning. 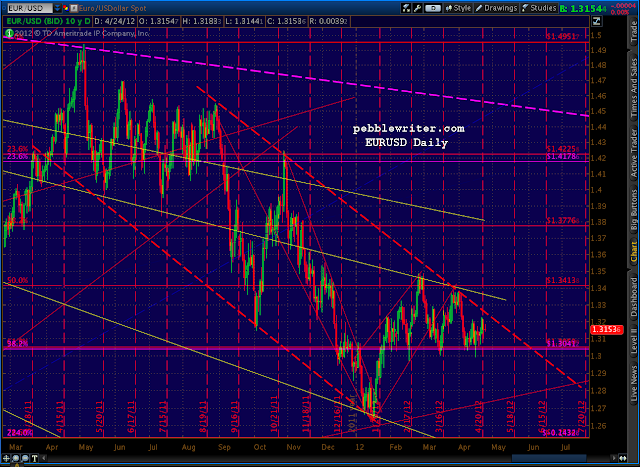 EURUSD has been stuck in that purple channel for years, and isn't likely to break out anytime soon. Note the fan line off 2000-2002 coming into play again soon. 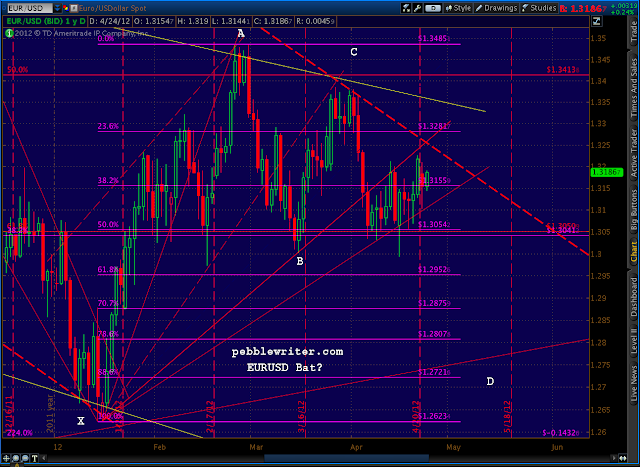 From a harmonic standpoint, the purple pattern calls for a trip to the .886 at .9115, but not anytime soon. The red pattern has more immediate import. There are plenty of candidates for a Point B -- near the .382, the .618 and the .786. While it's possible we've completed a Gartley, it normally requires a bit more precision than this, so I'm assuming that was a near miss. There's a good chance we'll target at least a Bat pattern with completion at the .886 of 1.2226 -- spitting distance from the larger (purple) pattern's .500. But, to get there, we'll have to continue following the red dashed channel and not be waylaid by the fan line. The channel is fairly strong -- in place for over a year. And, there's a fan line just above current prices for reassurance purposes. 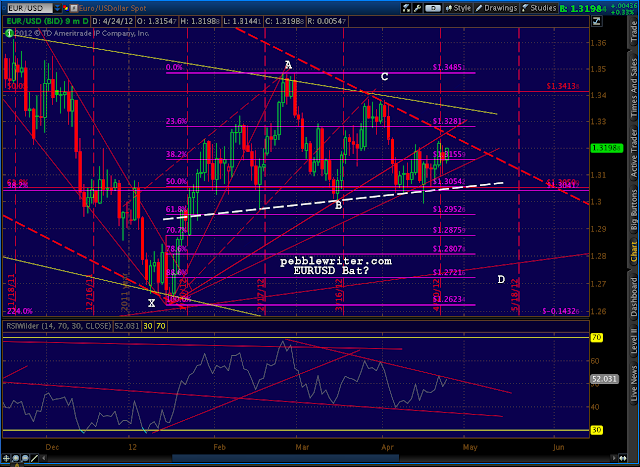 The close up picture below gives us an idea what to expect in the near term. This potential Bat pattern calls for a move lower, to at least the .886 level at 1.2721 -- which, coincidentally, is right at that fan line. We can also see that the last fan line off the presumed Point X leaves a rather narrow margin of safety for the next move down. 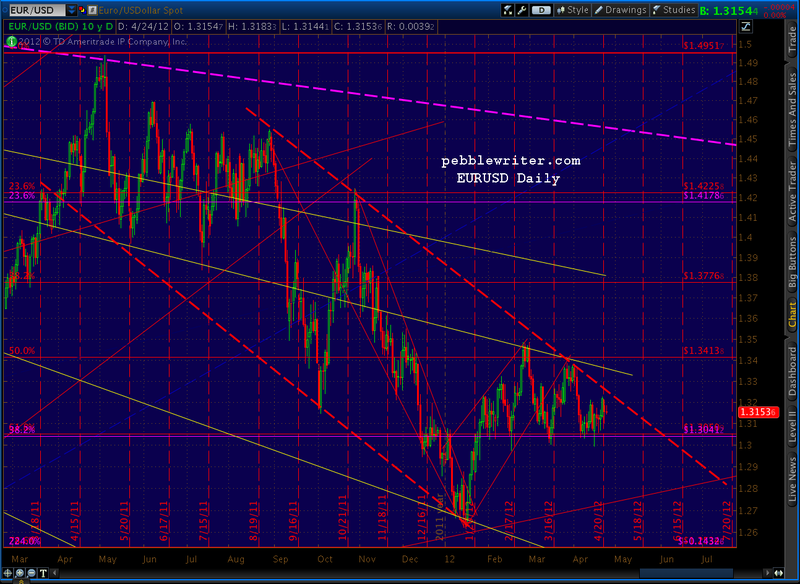 A break of 1.3110 would start the ball rolling. The H&S pattern we've been watching for what feels like forever has resisted playing out, though the channel will force its hand soon enough. 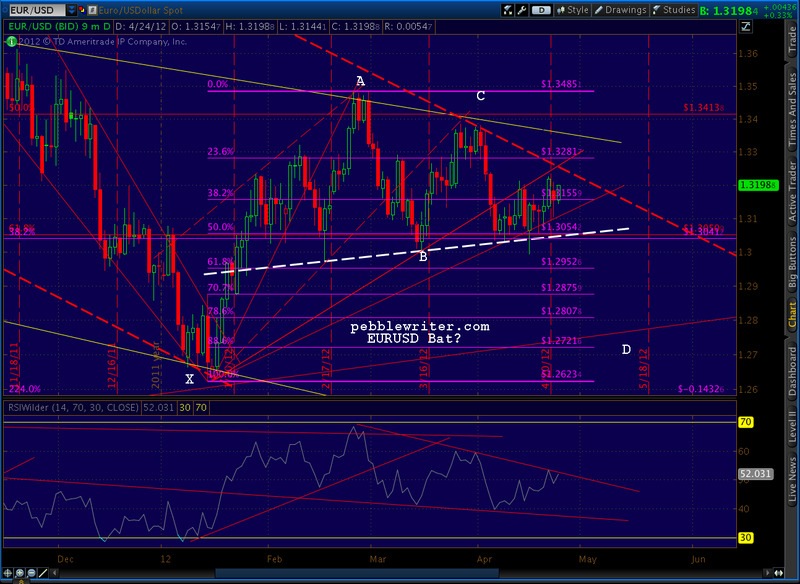 It's mirrored by an RSI trend line which is there for the breaking after another crash into the upper TL. Investors who play the EURUSD would be wise to use stops. 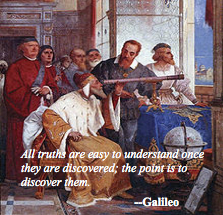 The ongoing problems in Greece, Italy, Portugal, Ireland, etc. have been exacerbated by election angst in France and the failure of the Netherlands government. But, the ECB has learned much from the Fed about propping up markets. While their efforts don't promise of a return to prosperity anytime soon, they've grown very fond of the stick save press release. They'll be using it a lot in the coming weeks.